How bad, how dumb, how driven by internal political stupidities, how simply nonsensically odd are the electricity troglodytes pushing to keep the old Liddell coal-fired power station open for a few more years? Their case is destroyed by a single graph. The graph in question shows the expected run off of installed electricity generation as existing plant ages and dies. The picture tells the 15,000MW story. The Liddell station closure is a minor blip in the broader scheme of things. 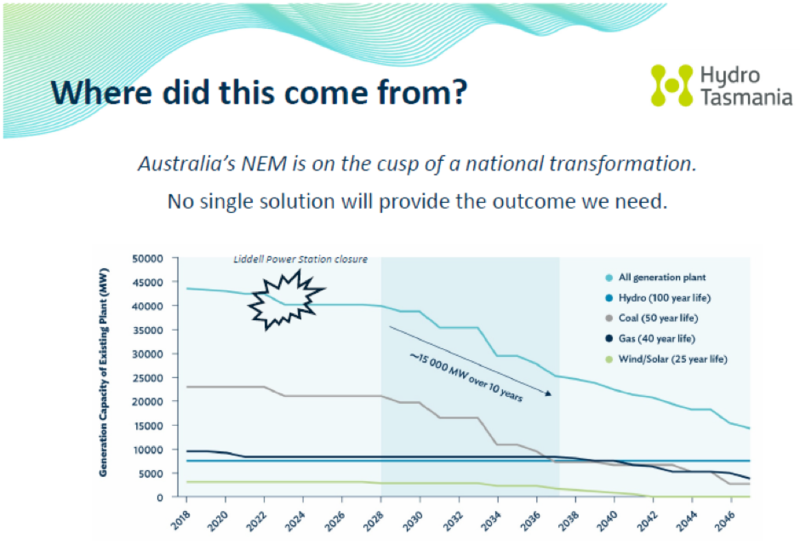 Extending Liddell’s life for a few more years would only steepen the capacity cliff we’re facing from 2028, would only make more urgent the need for new generation and batteries. The loss of Liddell is merely an early warning of the expected 15,000MW dive in coal-fired generation coming down the track. In that bigger picture, delaying the closure of coal burning at Liddell would achieve precisely bugger all. Arguably, it would be worse than bugger all as it would delay the investment in the alternative generation that AGL is proposing. Unless you’re a weird little coal-hugger, or strained by internal political conflicts, it’s an absolute no-brainer. The obvious question of what generation capacity needs to be built to handle that cliff apparently comes down to a matter of religion, whether you’re a member of the Free Market faith, or the Holy Coal sect. Or maybe it’s just internal coalition politics. The graph comes from Hydro Tasmania which, admittedly, has its own barrow to push. Doesn’t everyone in the electricity game? Hydro Tasmania is lobbying hard to win national support for turning the island state into the mainland’s biggest battery. I’ve seen the pitch presented and it has attractions. Tasmania already has significant hydro infrastructure and has identified suitable sites for pumped hydro that would be much cheaper than drilling through the dense rock of the Snowy Mountains. The other half of the equation – the energy to pump the water – comes from the Roaring Forties whistling around and over the west coast. As the Hydro Tasmania engineers tell it, Tassy wind is different, tending to blow more when Big Island wind is blowing less, especially in Victoria and South Australia. That means it would add some welcome diversification. 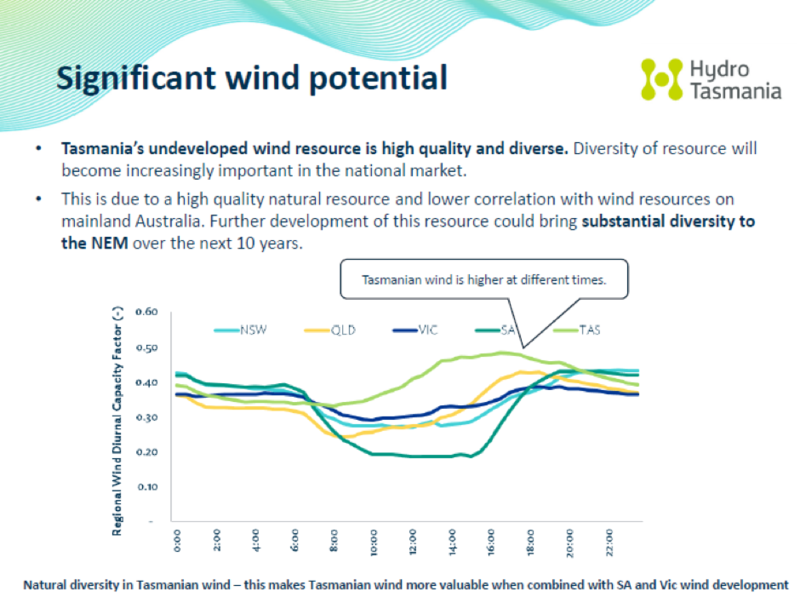 Tasmania sees the Big Battery and wind farming as a significant opportunity for investment in the state’s more depressed regions. The catch is that the idea requires building more interconnectors with the mainland. Yes, that would cost money. Hydro Tasmania reckons the state’s other benefits would make up for that. Besides, the approaching cliff means we will need multiple options to score the energy “trilemma” of reliability, affordability and sustainability. As the government wrestles with the disruptive ratbaggery within its ranks – alias Tony Abbott and Craig Kelly – over the National Energy Guarantee, the outlook should leave the coal lovers feeling a little, well, powerless. The Hydro Tasmania proposal only has to compete with the prohibitive expense of new coal-fired stations – and risk the private sector can’t see being worth the candle. After dithering for a decade, Australia has barely a decade left to get its energy house in order. Liddell, to take a line from Casablanca, doesn’t add up to a hill of beans in that bigger picture. Solar panels (with battery support) on every roof dramatically reduces the need for centralised power generation. Too hard? A thorough analysis and required reading for Coalition members. The majority of the thinking public are so far ahead of the Coalition on this issue of energy that it’s embarrassing to witness the Ministers regularly making fools of themselves in their support of the coal lobby. The NEG doesn’t articulate a message to gain public support despite the carrots offered to Premiers – who cares what they think anyway when it doesn’t translate to lower power costs? Mean while solar on our roofs is going gang busters and the Government fiddles around.